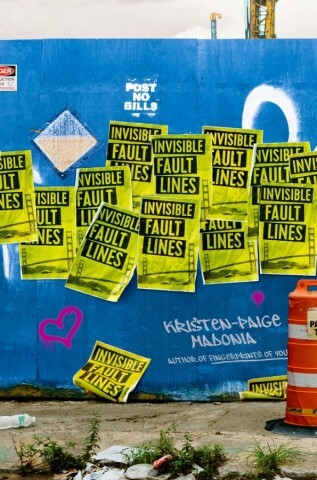 Today we're super excited to reveal the first chapter for Kristen-Paige Madonia's INVISIBLE FAULT LINES, releasing May 3, 2016 from Simon & Schuster Books for Young Readers. Below, you can read the chapter and enter the giveaway! My father disappeared on a Tuesday that should’ve been like any Tuesday, but eventually became the Tuesday my father disappeared. It was April 18, 2006. “Chicken piccata,” my mother said. “It’s Tuesday.” Because that’s what we ate midweek back then. It was the year I knew things would change. The summer before, I helped start a band as the drummer. On New Year’s Eve, I got my nose pierced. SAT prep classes and cross-country running practice swapped places that spring with rock concerts and poetry slams. I hadn’t told anyone yet, but I’d decided I wanted to study abroad. I wanted to go places where I couldn’t speak the language, so I stashed my college catalogs under my bed and requested passport forms instead. I collected foreign-language dictionaries that I stacked in piles and stored on a shelf in my closet. Spanish. Turkish. Thai. It was the year we were supposed to go from teenagers to . . . not adults, exactly, but instead to that thing in between. It was April, and I was a junior, the last year before I had to commit to college or hold off, the last year before I was expected to decide exactly how the next four would go. A lot was supposed to change that year. But not my father. He’d never changed a day in my life until he disappeared. Before, he did this: Awoke to his playlist of live concerts by The Who and the Stones and occasionally Stevie Nicks because sometimes, he said, a smoky, sorrowful love song is the best way to pull yourself out of your dreams. Coffee, black. One mug before and one mug after his shower, and he always, no matter what, ate toast with peanut butter in his pine-green bathrobe. A handful of raisins sprinkled on top. Quick change into dark-washed jeans, gray Vans, and a long-sleeved T-shirt because that was his favorite perk of his job –- casual dress. Black wire-rimmed glasses and a small shot of orange juice while he organized his papers in his brown leather backpack. The juice glass was an antique, cut with a floral design from the twenties. We’d found the set when we cleaned out my grandmother’s condo in Chicago after she died the year before. Besides her Italian recipe books and photo albums, the glasses were the only things of hers he brought home. Glass rinsed and on the drying rack. Brown leather watch, set five minutes fast. Puffy North Face vest, navy blue with a small hole next to the left pocket -– a cigarette burn from a friend’s Marlboro at a club in Chicago back when he was young. His forehead pressed against my forehead with toothpaste breath between us before he jabbed me in the ribs or plucked my ear. “Callie,” he’d say. “Be good, all right?” Or maybe, “Stay out of trouble.” A kiss on the nose for me, and then a kiss for my mother, too. Out the door, the sound of him locking it behind him. The 1BX bus, a direct shot to downtown San Francisco while he read Wired, National Geographic, or Popular Science. He worked in a high-rise corner office with a view in the morning and then at job sites around the Bay Area in the afternoon. Hard hats and soil samples. Backhoe digging. Water testing. Phase II site assessments. Meetings with people who wanted to build condos, who wanted to develop on top of land that had once been industrial buildings, and before that, a different kind of city, and before that, the Bay water. My mother tossed the grated lemon peel and a handful of capers into the pan. “He’s just late, that’s all. No worries,” she said. Her feet were still encased in her work shoes, the thin white skin of her ankle pinched and pink inside the leather heels she’d bought off a clearance rack that fall. She was infinitely tired. Too tired for what-ifs. My mother worked in the library at UCSF, and in the spring she formatted and archived dissertations for grad students so they could be bound and shelved for reference. Her eyes were often mapped in red, her fingers sliced with paper cuts. It was dinnertime on a Tuesday, and he was not home yet. He was working late, she said. He was running late or moving slow. No worries. The bus probably broke down. The job site probably took longer than he’d planned for. Before, I did this: Awoke to the alarm on my nightstand. The White Stripes playing from my speakers, a quick IM to my best friend, Beckett, and one full mug of water after I brushed my teeth, but before my shower. The mug, brought back from Portland when Beckett visited his cousin the previous summer, was chipped above the coffeehouse logo, and sat on the counter next to the sink in my bathroom. Shower, quickly, after my father had had his turn and before my mother took hers as to avoid risking cold water. Bell-bottom jeans, gray tank top, long-sleeved shirt, and my red zip-up hoodie. Wet hair knotted into a sloppy bun. Lip gloss and a quick brush of powder on my forehead and nose. My nose, small and ski-sloped like my mother’s -- too small for my face, I’d always thought. Black mascara. My father’s dark Italian eyes, my favorite trait. Small gold necklace -– the only piece of jewelry from my grandmother that I took when we cleaned out her condo in Chicago. The cornicello: an Italian horn-shaped pendant worn to protect against the evil eye. Read and reply to IM from Beckett. Cup of coffee in the kitchen, lots of cream and sugar. Explanation to Dad that coffee is simply a device to consume lots of cream and sugar. Piece of toast smothered with butter. Cinnamon and sugar sprinkled on top after the butter has made the toast wet enough to turn the topping into warm brown goo. My forehead pressed against my father’s forehead with toothpaste breath between us before he jabbed me in the ribs or plucked my ear. Me telling him, “I’m always good,” and then the click of the lock behind him. The sound of my mother’s shower ending as the water flushed through the pipes, and then her calling “Bus in five minutes!” from behind their bedroom door. IM Beckett from my bedroom. Blue Converse high-tops with my last name, Pace, on the left shoe, inked next to a drawing of square buildings, star shaped snowflakes, and a lamppost -- a winter cityscape graffitied during biology class. On my right shoe, a treble clef, a black arrow pointing up, a small guitar, and our band name, Nothing Right, sketched after school in Golden Gate Park. My mother in the hallway with a question about my math test. Me, mentioning band practice that night. My mother with a question about college applications. Me, rambling about something that happened at work the day before. The thumping of The Clash in my headphones and an open front door. Me, asking about dinner. An hour after dinner, we called everyone we knew. Friends, coworkers, neighbors, poker-night players, and even the guy my dad bought bike parts from for his motorcycles. Forty-five minutes later we drove to his office, found it empty, and drove home. It took a million years to park the car because Wednesday morning was street sweeping, and every parking spot in every neighborhood close to our house was taken. Finally we found one, went back inside, and checked for phone messages. Again. Eventually Beckett and his mom, Lori, came over. Eventually, we called the police. Someone ordered a pizza with pineapple and ham -- the leftover chicken was cold and half eaten in the pan on the counter. I cut my fingernails, letting the clippings fly and scatter onto the hardwood floor. Mom changed from her work clothes to her sleep clothes, then back to her work clothes before the cops showed up. They talked to her and then they talked to me, but I didn’t talk to anyone after I talked to them, not for a long while. The words were there, thick jumbled things like rocks or cement pooling in my throat, choking me. I don’t know why, but suddenly words didn’t matter. There was nothing to say, really. Beckett ate pizza, and Lori made tea, and the police took notes and wrote down some phone numbers and left. We sat in the kitchen at the small, square table, and our mothers sat in the living room on the other side of the wall. One of them was crying, but I couldn’t be sure which. I shrugged, pulled a piece of ham off the pizza, and began shredding the meat into tiny strips I collected on the placemat. “Maybe he’s helping someone. Someone homeless he saw on the bus. Or a kid who can’t find his mom, maybe,” he said. I knew that when the cops asked, “Was anything out of the ordinary? Did he seem strange before he left for work? Did he seem distracted?” they meant that he’d left on his own. The thing is, when a grown-up disappears, people assume they made a choice to go. He’d gotten tired or restless and went looking for something more. Something different. He’d been fighting with his wife, with his boss, with his kid. He had a mistress. He had a plan. He had a midlife crisis. Here’s what people assume: My father, Aaron Pace, decided to leave. But here’s what I knew: Before he disappeared, there was nothing unordinary about us. Until that Tuesday, we were a perfectly normal family. And he never, not in a million years, would have walked away. Kristen-Paige Madonia is the author of the young adult novels Invisible Fault Lines (Simon & Schuster Books for Young Readers, 2016) and Fingerprints of You (Simon & Schuster BFYR, 2012). Her short stories have been published in various literary magazines including FiveChapters, the New Orleans Review, the Greensboro Review, and America Fiction: Best Previously Unpublished Stories by Emerging Authors. She holds an MFA in fiction from California State University, Long Beach and currently lives in Charlottesville, Va. She is a member of the University of Nebraska low-residency MFA Writing Program faculty and also teaches creative writing at the University of Virginia, James Madison University, and WriterHouse. 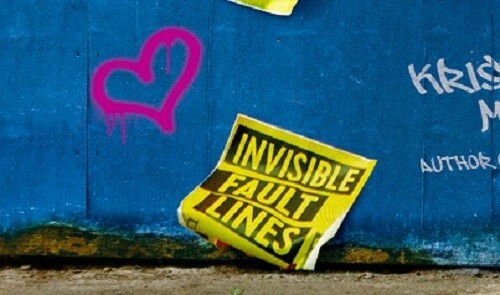 One winner will receive a signed copy of INVISIBLE FAULT LINES and a matching bookmark. What do you think about the first chapter? So this book looks like it's going to be amazing. I really enjoyed this teaser chapter. It had me hooked for mor . Can't wait to read it. The first chapter sounds SO good! I am really excited about this one- don't know how it wasn't on my radar, but it definitely is now! Thanks for the chance! That was so good it gave me goose bumps! Really, I had to go check the temp and it says 76 so I am really ready to read this great book! The first chapter really pulled me in! and I also love the cover! Callie wears a small gold necklace from her grandmother. Thanks for the first chapter--now I know I want to read this book! This first chapter was really good!